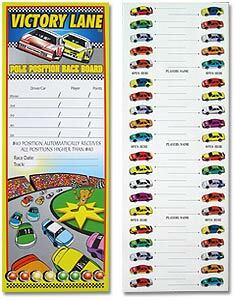 These Car Racing Boards are an excellent way to keep customers coming back to your bar, club, ore other venue! 1) Have your customers pick a line on the front of the board and sign their name. 2) Once the board is full, open the windows on the back and match the starting position to the posted qualifying order to determine the driver/car for the corresponding customer. 3) Then, the fun begins! Award prizes, food, drinks, or any award you choose to the lucky race winners. You can even use several Car Race Betting Boards per race so that each of your customers can race more than one car! (Minimum order is one dozen car racing cards). We also offer 100 Box All Events Sportscards!